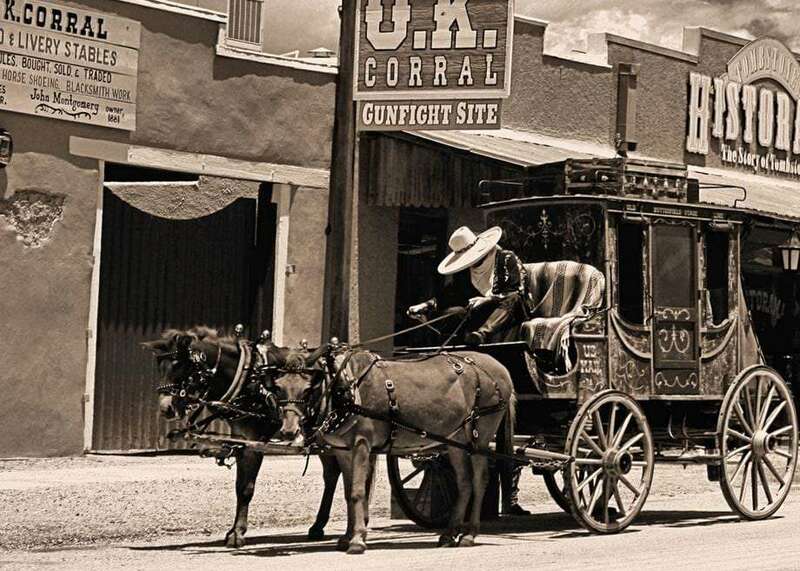 Is Tombstone, Arizona a tourist town? On a frontier afternoon in 1881 Doc Holliday, along with Virgil, Morgan and Wyatt Earp, shot and killed three outlaw cowboys at the OK Corral. Today, vacationing doctors and bikers and Germans in tour buses walk the streets in dockers, American made chrome and whatever it is that German tourists wear. What 121 years ago was a deadly shoot out made famous by children’s imaginations and the silver screen—which only lasted thirty seconds, but ended in three men dead and ended in everyone who didn’t run and Wyatt Earp unharmed—is now a playground for vacationers. As a much younger man, I recall Val Kilmer’s portrayal of Doc Holliday, long black coat, ever sure of his capability as a man and friend but simultaneously suffering from blood-producing coughs caused by tuberculosis. I recall how he moved a quarter across his fingers, slow and cool and completely controlled, even in the most heated of moments. 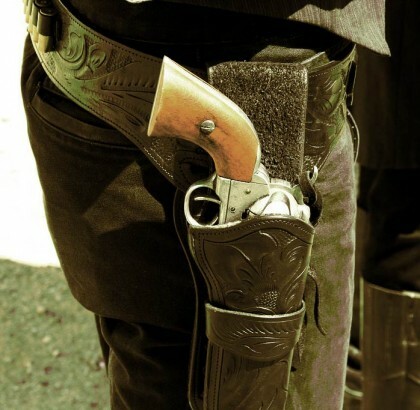 And doesn’t every boy, whether they even know the general story of Tombstone, Arizona, want to be a cowboy? Even as we grow into adults, it’s a position to be respected, to be idolized. Only the fireman and astronaut can stand up to the test of time the cowboy has proven when it comes to top three dream positions when asking an 8 year old. What may have been lost or perhaps simply traded over time is not to be mourned, though. Where a rugged and desolate place like Tombstone once showed America’s will to travel to the middle of nothing—a desert harshness twenty five miles from the nearest railroad in a time when twenty miles on the back of a horse was a solid day’s ride—to seek riches or merely a day’s wage or a new start far from civilization, we’ve traded over more than a century’s worth of relatively safe commutes to the grocery store. Where painted ladies of the night and unbathed miners once traded coins for cooch, we can now safely walk between gift shops and Smoke Free Arizona bars. Yes, the times they have certainly changed, but rest assured, rugged men with guns who would shoot you over a misguided glance still exist. Just not in Tombstone, Arizona anymore. That said, if you’re the family man type who enjoys an afternoon walking through a piece of history gone not-as-far-touristy as you’d think, well what better excuse is there to put on a cowpolk’s hat and maybe even a pair of chaps with the kids while you walk around a town full of history for the taking. Yes, there are touristy shops all around, but when I was buying two metal badges, one that read Deputy and one Marshall, do you think I blinked twice before asking the Lady which she’d prefer to wear? We rocked those pins for weeks before they found their way off of our coats and onto the visors of our truck. Ladies hat shops featuring items not seen in modern use since before the term modern meant “after the 1800s” and the ability for just any woman to wear them around without getting much more than half of a second look? Now that’s what I consider priceless. Yeah, Tombstone’s a tourist spot, there’s no doubt about it. But it’s the best kind of tourist trap for families with kids, especially little boys and the best kinds of children on Earth: tomgirls. There’s a little something for everyone, it feels real, especially to a six year old boy who, and I have some experience in this area, upon seeing a real live horse that he’s allowed to ride behind driven by a man who almost definitely has a six shooter hanging from his waist. At the very worst, you’ll have taken a day’s excursion from the glory of Bisbee to somewhere new. Which, by the way, is as gorgeous an open desert drive as you might ever see.